Red Honey Suckle Mistletoe is a large branch parasite. It is a shrub which is much branched, 1-3 m long. Branches are swollen from the base, and the bark is dark gray. Oppositely arranged leaves are 7-15 cm long, variable in shape. Leaf stalks are 1 cm long, and the midriff is red. Flowers occur in stout racemes in leaf axils. 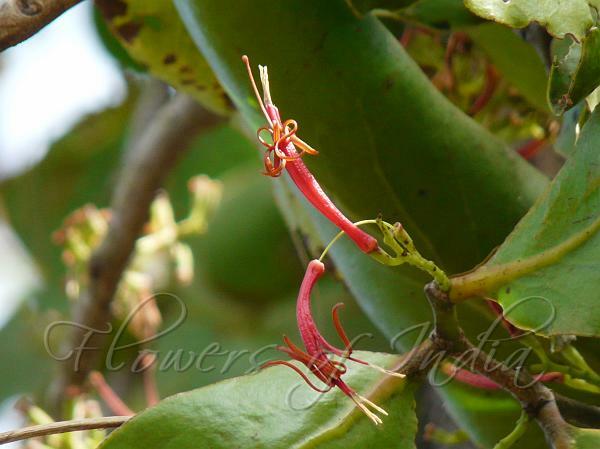 The flowers buds look like long red tubes. Flower tube is 3-5 cm long, red, The five narrow petals or lobes of the flower tube, greenish or yellowish, are upturned. Stamens, 4-6 protrude out of the flower. The green style is slender and is longer than the stamens. The plant has a very close cousin with white flowers, Honey Suckle Mistletoe. Found Flowering: October. Identification credit: Pankaj Kumar, Stephen, Aparna Watve, Swagat, Dinesh Valke, Shrikant Ingalhalikar & J.M. Garg Photographed in Maharashtra.